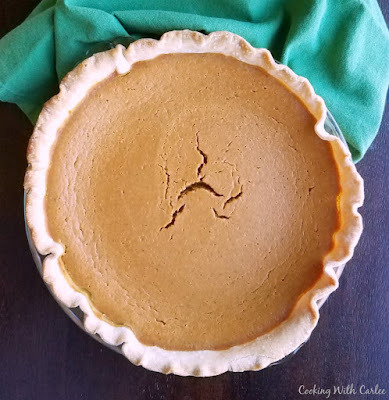 This pumpkin pie is kissed with a bit of maple flavor to heighten the warm sweet notes. Such a small change makes a big difference! I know pumpkin pie is usually reserved for Thanksgiving, but I'm not sure why. If you like it, have it any time! I enjoy pumpkin pie baked oatmeal all fall and winter, so why not the pie too? You may have noticed I also have a little thing for maple. 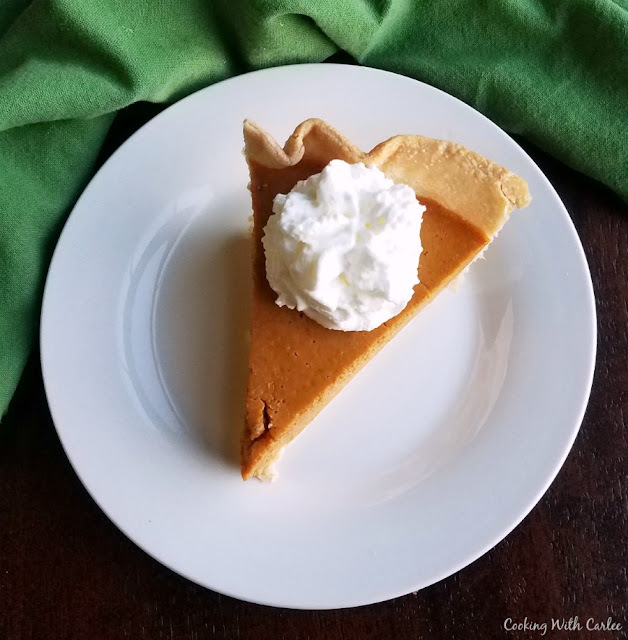 I just love the warm sweet notes it adds to things like sweet potato casserole, roasted vegetables and whipped cream! It just makes it feel extra special. Of course there is the buttercream, baked beans, the oatmeal and granola as well. So of course adding a bit of maple flavor to pumpkin pie seemed like a natural progression. I would love to work on a way to work on a way to use the syrup as a sweetener. But Thanksgiving isn't the best time to experiment, especially when there are so many other things to be done. That might make a fun winter project one of these years. I just need to talk my husband into liking pumpkin pie first. New recipes mean multiple trials and I am not a fan of waste. And I'm not sure how many pies I should eat. My poor jeans would eventually stage a mutiny! So in the meantime I added a bit of maple extract to a classic pie recipe and the results were scrumptious. Of course I used the real deal maple in the whipped cream. On second thought, I think I'd be ok eating all those trial pies! Do you ever eat pumpkin pie besides on Thanksgiving? Is there anything else you only enjoy once a year? Roll out you pie crust and place in pie dish. Crimp edges and place in refrigerator until ready. Mix remaining ingredients until smooth and completely combined. Bake 425 F for 15 minutes. Then reduce the heat to 350 F and continue to bake for 40-50 minutes or until set. Be sure to watch the edges of the crust and cover them if they get to dark. Cool on a rack for 2 hours and then refrigerate until ready to serve. That hint of maple in there is perfect! You are the best my friend, always always such amazing recipes that I've made and loved! Have a great day! Pumpkin pie really should be more of an all fall and winter thing I think. It's too good just to relegate to Thanksgiving. Especially this one! I loooooove maple so much! I know, it's too good to only be eaten one day! I seem to want to add maple to EVERYTHING lately. I just can't help it! 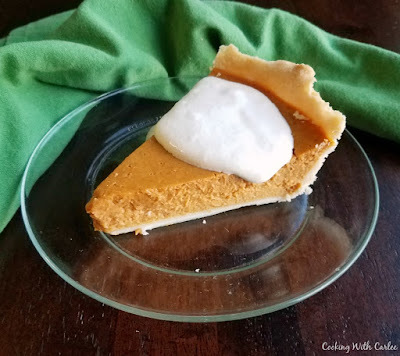 I love the idea of adding maple flavor to pumpkin pie. I'll be looking forward to the maple syrup recipe! It seems totally possible, doesn't it? It will give us something to work towards! I don't know why I only make pie at Christmas and Thanksgiving! This one looks so good, Im going to make it whenever I get a spare evening! Even if it's just some random tuesday! I like the way you think. Tuesday pie sounds like the best kind of pie to me! Hi Carlee, I really must pickup a bottle of maple syrup when I see it, I have no idea what it tastes like. I imagine pumpkin pie to be proper comfort food. Pumpkin pie is definitely comfort food and maple syrup is like a warmer version of honey with a milder taste. It's really hard to describe, but super delicious! 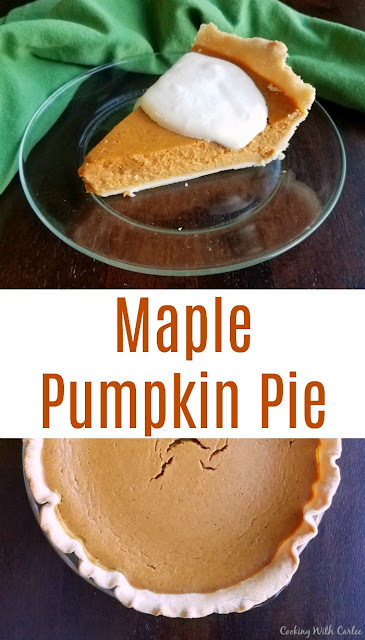 I love adding maple to anything, so I definitely need to try this! Love this! Thanks for sharing at Friday Frenzy Link Party! PINNED! Me too! A bit of maple makes everything a little bit better! Your Maple Pumpkin Pie will be delicious! Hope you have a great week and thanks so much for the party! I bet the addition of the maple makes this so scrumptious! I am a pumpkin pie fan, yet I have no idea why I only enjoy it one day a year! Thanks for sharing this with our Merry Monday party recently; I'll be featuring your pie at our upcoming party. Thank you so much! We need to start having pumpkin pie more often!